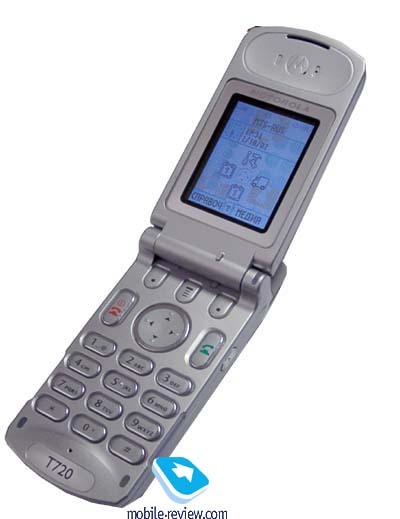 For the first time Motorola produced a folder type phone with a colour display. The model immediately aroused everybody's interest and a lively discussion. The question what class it refers to was one of the most vivid being discussed. In reality it is a fashion phone in pure form. The absence of many features which are necessary for business users proves it one more time. The phone is rather controversial, what caused such debates. From our point of view it is a transitional model, already in the beginning of the next year we'd see a better version and after that - the other model. But let's return to the phone itself. 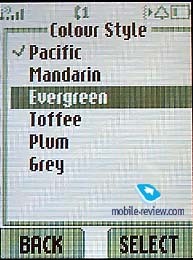 Motorola T720 is available in several colours, but in practice we can find only phone of silver colour now. May be later another colours would appear. The design of the phone is not typical for products from Motorola. The engineers step aside from rounded forms and constructed a right-angled handset, it is nice looking and stands out by the design. For the first time a new kind of antenna was used here. Thanks to its size, it's easy to wear the phone in the pocket of the trousers. The dimensions of the phone are 90 x 47.5 x 21 mm and it weighs 101g. By the way, a service indicator is placed near the antenna. 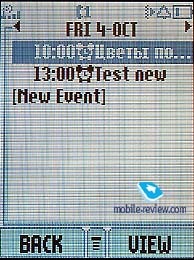 When the phone is closed, one can see an external display on the front cover, which shows one text line and one line with icons. The resolution of the screen is of 96х32 pixels, the display has pastel blue backlighting. If you look at the right-hand side, you'll see a dictaphone key. This key is also responsible for a voice dial. Two volume keys are positioned on the left-hand side, a portable handsfree connector is situated there too. An incoming alert and a vibrating alert will be switched off while incoming call if you press a lower volume key. A bottom side of the phone contains a system connector. Pay attention to the horizontal slot - it's a loudspeaker outlet. It is a very original decision, isn't it? The phone would've been heard at all without it, as the loudspeaker is inside the phone in the closed mode. 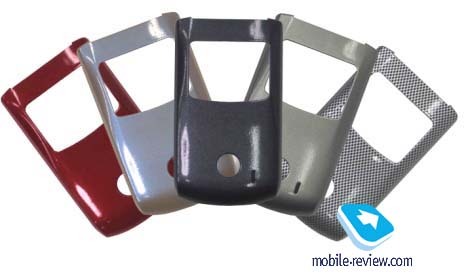 This hole is also necessary to remove an upper cover, it is interchangeable in this phone. The rear part, which covers the battery also can be changed. A small effort and you remove the upper cover and easily put a new one. If you need, you can open the phone by one hand, but it is more comfortable to do it by both. Inside the phone we see s colour display (STN technology). 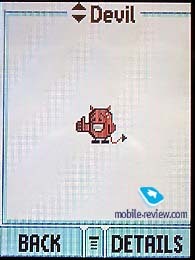 It shows up to 4096 colours and has a resolution of 120x160 pixels. 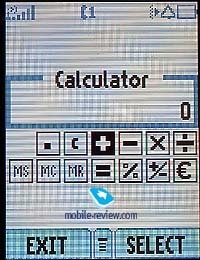 Due to the high resolution, the screen can display up to 8 text lines, a line with tips to the soft keys and a service line with icons. The quality of the picture is not bad, but there are shortcomings, which are typical for this kind of displays. The information is almost invisible without a backlighting, and it is also impossible to read anything in the sunny weather. Of course, this defect is compensated by the external display, which shows all the information while incoming call. As for me, STN matrixes are more comfortable in the phones of other manufacturers. The information is clear without the backlighting and it is hardly readable in the sun light. Here it is not so. A keypad is positioned on the lower part of the phone. It is made of plastic, the keys are pleasing to touch. The keypad is really good here. The functional keys are well-spaced and comfortable to press. So it makes only positive impressions. Soft-keys are under the screen, in spite of the small size, they are also very convenient. A navigation key allows to move in 4 directions, the central pressing is not available. The keys backlighting is pastel blue and all characters are visible in different lighting conditions. One can see a battery cover from the rear of the phone, it has a slight horizontal backlash and the phone can scratch in the hands sometimes, but you don't pay attention to it. Motorola T720 "stands out" by the autonomy among the phones with the colour screens, the lithium-ion battery is only 550 mAh. According to the manufacturers the phone can work 165 in the standby mode and up to 165 minutes in the talking mode. Our practice tests showed that the autonomy of the phone could reach only one day in case of 20 minutes of talking and 15-20 minutes of using other applications. If the talk time is less and you don't use applications the phone can work one day and a half, not even two. It's a pity that a battery of external capacity can't be obtained even as additional accessory. The phone just doesn't have space for it. I tried to remember such short time of working of the other phone models, and remembered only Samsung A 400. A full charging lasts about 2.5 hours. A new intellectual charging system is used here. In spite of the compatibility with the old chargers and a possibility to use them, I don't recommend you do it. In our case the phone didn't show a process of charging with the old charger, though it was going. Even after the first switching you understand that an interface of Motorola T720 was considerably changed for the better. A battery status, time and date and analogue hours are displayed in the standby mode. Four icons associated with the navigation key are placed in the center. You can set the most frequently used menu items there. One touch and you are in the desired menu. 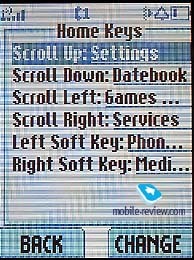 You can also change the settings of the soft-keys, situated in the bottom of the screen. Press a central Menu key and you are in the main menu. It can be displayed as a list or as a set of icons. There is no shortcut numbers navigation here, but you can set shortcuts to the specific items and use them for a quick moving. You can also add a voice tag to each shortcut. The advantage of the shortcuts is that apart from menu items you can point a wap-page. In this case the page will be browsed via Wap. You can sort the main menu by your wish, for example, move the most frequently items to the beginning of the list. And now some words about negative moments. The moving through the menu has a small delay what can be explained by the fact that the phone is based on the old platform and there is lack of processor power. Let's consider it as a constructional shortcoming of Motorola T720. Before we turn to the main features, I'd like to say that the phone supports a predictive text input - iTap, for both Russian and English. The quality of the realization is great. Phonebook. 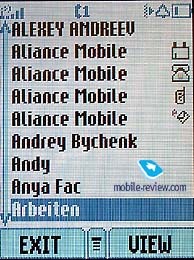 The structure of the phonebook resembles one in Motorola v60i, v66i. It is possible to save up to 1000 contacts with the phone numbers and e-mail addresses. One can add only one number to the name, though while entering the text, it looks as though you can input more information. 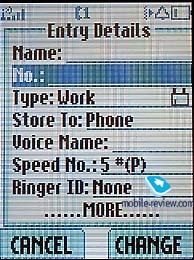 You set the phone type while entering the number, what allows to use quick dial (# number). The problem is that the phone tries to dial the number when e-mail address is saved as a quick shortcut, there are no warnings. The phone has a voice dial (up to 20 numbers),which works without any problems. You can display only phone numbers in the phonebook list (by default) and make search by the first letter. Caller groups are not available. Messages. 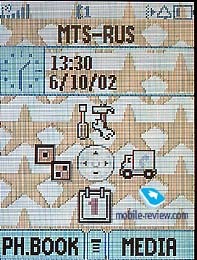 The phone memory could keep up to 20 messages, there is EMS support (version 5). 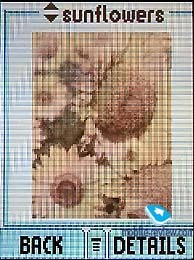 10 sounds, 15 animated and 8 static pictures are added for the EMS-messages, some of them are very nice. It's interesting that a full mail client (POP3) is appeared in T720. You have an opportunity to create templates. In the whole the possibilities are usual. Media Centre. A software to view graphical pictures and a musical editor are hidden here. Apart from the pictures for EMS-messages there are pictures that you can use as wallpapers. The quality of photos is quite satisfactory, there is moire and color transfer is not good. The stave is absent in the musical editor, the melodies are displayed as a set of numbers. You can save up to 32 of your own melodies here or receive them with EMS-messages. Datebook. Up to 500 reminders can be kept in the datebook. An alarm-clock, which can alarm once or daily, is placed here too. 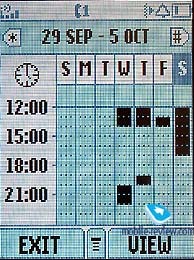 You can also set a special day for each month or a specific date to alarm. It is not the most handy alarm-clock among mobile phones. A calendar shows events by weeks - you see вы видите временную сетку, а сверху отображаются дни недели и диапазон дат. You can scroll the weeks with a help of the navigation key, but can't scroll the schedule by hours. 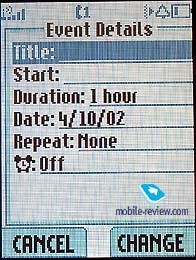 As a result, the limit of the day is 12 hours (so much can be shown on the screen simultaneously), you can set the beginning of the day but it is universal for all schedule, what is inconvenient. A simple example: suppose, I have one meeting at 9 o'clock, than a lunch at 12 at home and a business dinner at 9. So, if I input all these events in my datebook, I will be able o see only two of them at the same time, what is very uncomfortable. The other shortcoming is that the event duration can be only half hour, one hour, two hours and etc. So, the shortest period is one hour. As I learnt at first hand very often meetings last 1.5 or 2.5 hours. But it's impossible to input them in this datebook. To say the truth such drawback as weekly view is not very serious because you also have a daily view and then, all list of events is displayed. A sound reminder can be set for certain events, but it can alarm only before the event, not on time you set. A monthly calendar view is unavailable. Calculator. This feature is one of the items of the main menu in this model. It is rather convenient, and supports exchange rate for one currency. Dictaphone. Up to one minute of talking can be recorded and saved in the phone memory. The dictaphone is activated by the holding of side key. Recent Calls. The last 10 received, 10 dialed and 10 missed calls with date and time indication are stored in the phone memory. Here you can also view the calls duration and cost and also the counters of received and transmitted data (GPRS). Ring Style. The user could select several ring types, there is a mixed mode, when firstly, works vibrating alert and then the phone rings. Here are also the settings for ringing tones, SMS-messages and alarm-clock. Games&Apps. 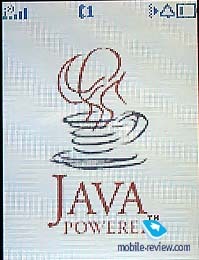 The phone supports Java (J2ME). 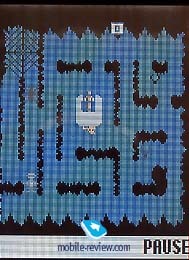 All the games, which are offered, are written on Java. Depending on the country the set of pre-default games can be changed. 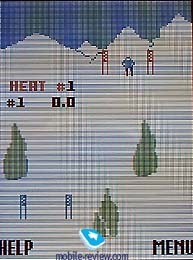 We had several games in our sample: MotoGP, Skiing, Night Stalker (a kind of PacMan), Astrosmash (space Arcade) and classical Tetris, which had several levels. It's interesting that all games were created in eighties of the 20 century and now they are just compiling for Java. 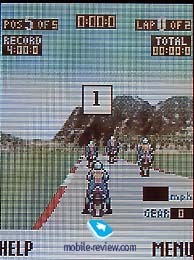 The moto-races appealed most of all, the other games are not so interesting. 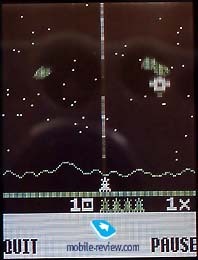 It's possible to download additional games and applications vie both GPRS (по воздуху) and cable. 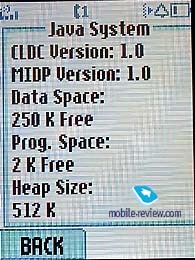 About 1 Mb of memory space (512 Kb for programs) can be used for Java. WAP. 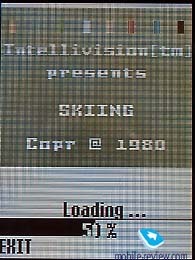 There are several items in the main menu, connected with wap-browser (1.2.1). 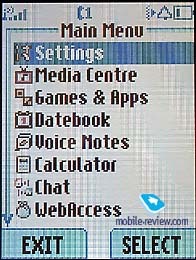 Firstly, Chat, which is compatible to the one in phones from Nokia. And secondly, WebAccesses, which give an access to the wap-resources. Settings. Here is the vast majority of settings is collected. 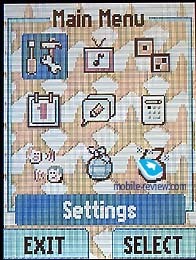 For example, you can adjust a screen, set a screensaver (any image), set wallpaper (either in full screen or a small picture). 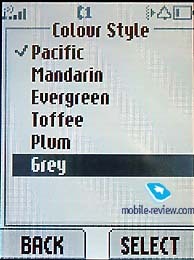 Naturally, you can choose a menu colour interface. Here are also the security settings, language, quick dial (it's not understandable why they are here). The connection quality is quite good, the volume of the loudspeaker is sufficient the sound is clear. The polyphony is only 4-tones (16 instruments). The ringing tone is very quiet, it is practically not heard. Here you can listen to the melodies (mp3, 1 Mb). Thanks God, the vibrating alert is rather strong and you can feel it even in from the bag. The phone supports GPRS (4+1), it's pleasing of course, but using of this technology is necessary, first of all, to support Wap-browser and to view e-mail. You need to purchase cable to connect the phone to PC. IR-port is absent here. The quality of the screen is not bad but you can't use it in sunny weather. The other great drawback is a low autonomy, every day you need to-recharge the phone. In any case, T720 would be sold because many consumers pay attention to the phone design first of all, not to features. 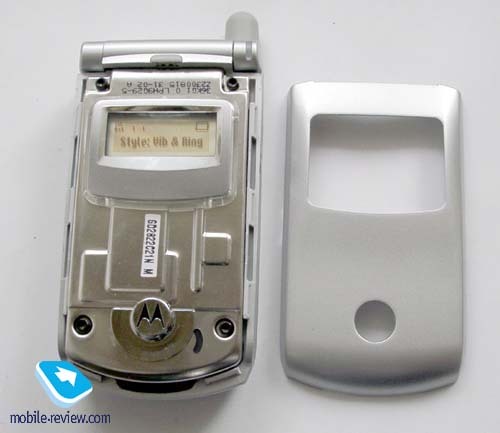 Unfortunately, Motorola T720 is only a transitional model and great sales are not expected. 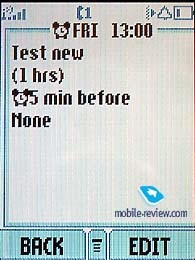 The fact that the phone supports only two bands (GSM900/1800) is another evidence.